Successfully Added Premium 2.5 and 3.5 SATA Hard Drive Docking Station with One-Touch Backup to your Shopping Cart. Premium 2.5 and 3.5 SATA Hard Drive Docking Station with One-Touch Backup: Ultra convenient SATA HDD docking station and multi-format memory card reader with OTB! Now you can instantly add a hard drive to your computer system, hot-swap multiple disks, read all of today's flash memory cards (including SD, MS, microSD cards), and backup your home or business computer with an instant OTB function. How does it work? Simply place your 2.5 or 3.5 inch SATA hard drive into the docking station and connect the provided USB cable to your computer and you're ready to go. Yes, it is as simple as that! Now you can finally add a hard disk drive to your computer just as easily as you can with any plug-and-play device. In addition, the Premium SATA Hard Drive Docking Station has a one touch back-up function; just press the OTB button and you can instantly backup the folders you have pre-selected with the included software. Guess what? This docking station can still do more! Do you need an all-in-one card reader for your collection of old and new SD, Compact Flash, Memory Stick, microSD, USB and other memory cards? Now you have a single hub to read them all, copy from/to them, move files back and forth from your HDD and memory cards, and more. Great for anyone who regularly uses a DV camera. Whether you need more data storage space for your home or office computer, this SATA HDD docking station makes it easy to simply add the additional disk space you need. Backing up your computer data is crucial these days, especially given all the computer viruses and such we need to constantly guard against. Losing any work projects, family digital pictures or even your personal music + video collection would be a huge loss. With the Premium SATA Hard Drive Docking Station with OTB, backing up your valuable data or moving information from one computer to another has never been easier. This is a great product to get for yourself, and it also makes a wonderful product to give as a gift to any friend who has a large digital movie or music collection. In stock in our warehouse right now, buy a single piece at our low wholesale price or buy in bulk for even greater savings. 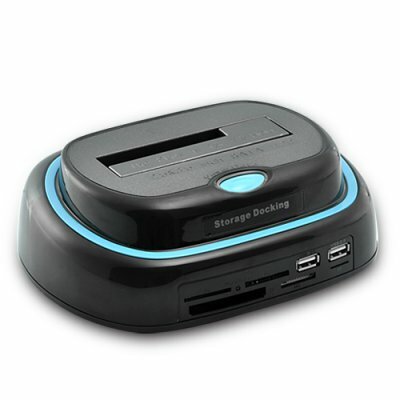 Get your data saving SATA docking station today! Backing up your valuable data or moving information from one computer to another has never been easier. Simplify your life, save time and money with this valuable new computer add-on product. SATA HDD's are the cheapest (per GB) and fastest storage medium available today. For the price you would pay for a 64GB USB flash drive you can buy this product and a 500GB SATA HDD, providing almost 10x as much space for the same price! Can I use this unit to copy files from SD cards to an external HDD? Can I use this model with my Linux computer? Not as we tested it. If you are an experienced Linux user you will be able to find software on the net to help connect this unit with your computer, however we do not guarantee compatibility with any particular Linux distributions.